A farm boy in the city as well as an engineer, Ellis Phillips kept the company mainly of his work associates and his Methodist fellowship during his young adult years. He was 46 years old when he married Kathryn Sisson McLean, daughter of an itinerant prairie minister, a widow and single mother who had become Dean of Women at Ohio Wesleyan University and President of the National Association of Deans of Women, which she had helped to organize. It was to be nearly thirty more years, after the Depression and World War II, that Ellis Phillips transferred assets to the Foundation so that it could begin operation. He and Kathryn Phillips worked together to determine the grant-making. "When the struggle for achievement is over and one has become something of an onlooker," Kathryn said, "it is what we have managed to give that we still possess and that sustains us." The major grants of the Ellis L. Phillips Foundation during the founder's lifetime were to his alma mater, Cornell University, to build Phillips Hall, housing the department of electrical engineering, and to Ohio Wesleyan University, his wife's alma mater, to build Kathryn Sisson Phillips Hall, housing the departments of education and religion. 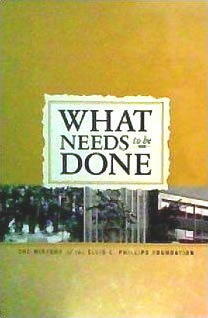 After Ellis Phillips died in 1959, the leadership of the Foundation was assumed by Ellis L. Phillips, Jr., the only child of Ellis and Kathryn Phillips. The younger Phillips was a college administrator and was president of Ithaca College during the 1970s. Under his leadership, the Foundation began to make grants of an entrepreneurial nature, most notably a Foundation-initiated program of internships in academic administration to prepare the future leaders of institutions of higher education. After three years, the success of the program attracted the sponsorship of the Ford Foundation, and its successor program is still in operation under auspices of the American Council on Education. The third generation of the Phillips family, the children of Ellis L. Phillips, Jr., and Marion Grumman Phillips, has continued to volunteer time, talent, and work to the Foundation. Larry Phillips recently retired as the third president of the Foundation, and each of his four sisters has served on the board. The fourth generation, now led by the foundation's fourth president, Hardy Grumman Watts, is poised to lead the foundation into its next chapter. Although the family remains intimately involved, each generation has consciously worked to align personal interests with community needs in order to make their grant-making as effective as possible. By diversifying the board and nurturing the entrepreneurial spirit, the Foundation has continued to initiate successful programs, most notably its creation of The Catalogue for Philanthropy, a vehicle funded by philanthropic organizations to promote and increase philanthropic activity by individuals. The spiritual beacon of the Foundation remains the simple question posed by Kathryn Phillips: "What needs to be done?"